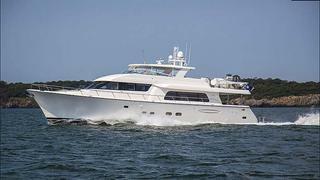 More price cut news as Gregg Child at Northrop & Johnson sends word of a $296,000 drop on the 24.9m flybridge motor yacht Playpen. She was built by Pacific Mariner in 2009 to a design by William Garden and accommodates up to nine guests in a master suite, VIP stateroom and a double and twin cabin plus a Pullman berth. Twin 1500hp MTU engines give her a range of 800 nautical miles at her cruising speed of 22 knots. On display at the Palm Beach show, Playpen is down from $5,595,000 to $5,299,000.